CHERAN, MEXICO (Report) — On the road leading into this hardscrabble town in Mexico’s southwest corner, there stands a checkpoint staffed by heavily-armed guards, clad ominously in balaclavas, or ski masks. This scene is not particularly unusual for this violence-plagued country, but Cheran is no ordinary place: seven years ago this month, the mostly indigenous townspeople here grew tired of watching the loggers illegally cut down their trees, and frustrated with the extortion rackets run by the organized-crime cartels, and angry at the politicians who did nothing to protect them or the forest that is central to the local timber economy. And so the denizens of this community tucked away in the state of Michoacán evicted the bootleg loggers and the mobsters who hired them; they kicked out the police department and the mayor and the city council and the prosecutors and the judges and they decided to do it all themselves. The gendarmes patrolling the city’s borders are, in fact, civilians. Cheran is no utopia, but virtually everyone here says they feel happier and safer with the new autonomous arrangement that is reminiscent of the Paris Commune, the radical workers’ movement that governed the City of Lights for two months in the spring of 1871 before authorities and industrialists managed to regain control. “Little by little, people have realized that this new system is the most suitable for us … now we take care of each other,” David Ramos Guerrero, a local resident, told MintPress News. Easy pickings for the cartels, until . . . Surrounded by lush forests, Cheran is about 200 miles west of Mexico City. Its population of roughly 16,000 is predominantly from the indigenous Purepecha community, who squeeze out a meager living from agriculture — corn, oats, beans, wheat, potatoes, apples, apricots, pears and plums — and timber. The Mexican cartels typically associated with the illicit drug trade want a cut of any lucrative commercial enterprise, and for years the talamontes, or illegal loggers working on behalf of the ruthless La Familia mob, had toppled the trees — by one estimate, they had destroyed half of the 59,000 acres of forest — surrounding the community, hauling them off with impunity, and ultimately jeopardizing Cheran’s water supply. The townspeople’s complaints to their representatives at City Hall repeatedly fell on deaf ears until finally, the women hatched a plan. On the morning of April 15, 2011, dozens of women gathered at the Roman Catholic Chapel of the Calvary at the town’s edge and waited. As the trucks passed hauling their illegal bounty, the signal was given, and the women, armed only with fireworks and rocks and white-hot indignation, attacked, driving out the loggers armed with AK-47s. On Sunday, April 15, thousands turned out for a ceremony to celebrate the insurrection set in motion on that day in 2011. “That was the moment that the community, tired of the pilfering of our forest, tired of being manipulated by organized crime and the government, decided to rise up in struggle,” David Ramos Guerrero told MintPress News. 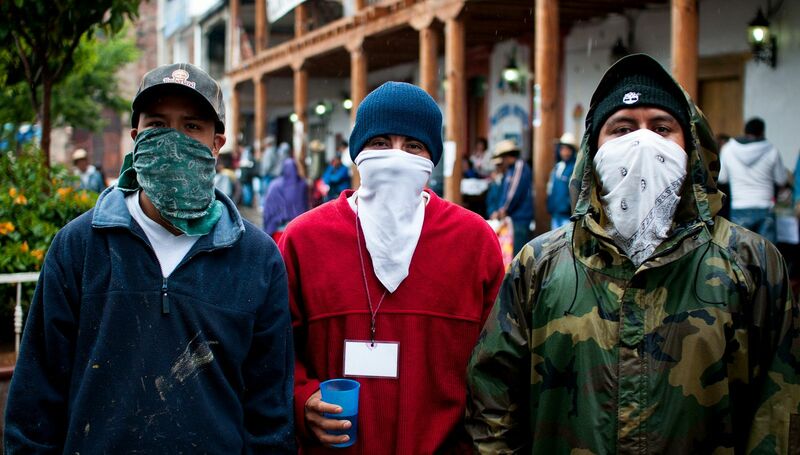 The cartels and their lackeys in the local government responded by shutting down cell-phone towers and electricity. That only served to light a fire under the community, quite literally. 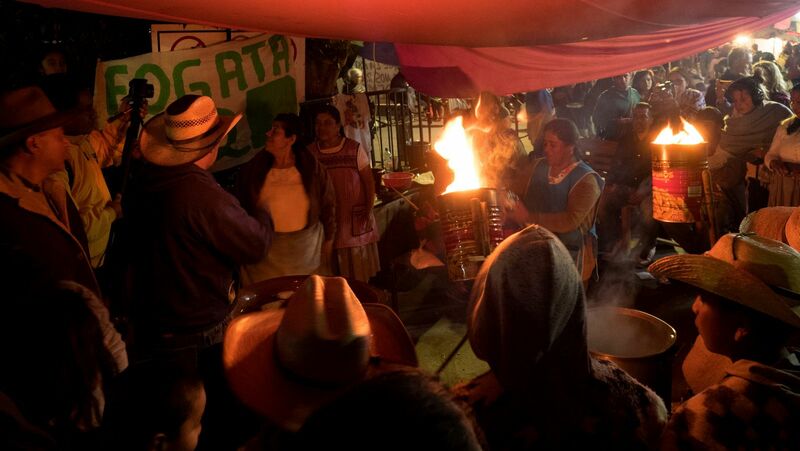 Overnight, the bonfires began to appear across the town, until eventually there were more than 300 to help the people keeping watch for the inevitable retaliation by the cartels. “They were principally a meeting point to defend ourselves against the organized-crime groups and the bad government that was in power,” said Guerrero. The day of the uprising, Luz Torres said that her first priority was the safety of her children. But as night fell, she saw her neighbors pour into the street, and she knew she had to join them. “We were on the street corner with fear, with a lot of fear,” said Torres. All they had was each other. The bonfires, or fogatas, were close enough that they were within yelling distance, so periodically they would call out to each other to check in. “Everything alright?” they would yell. “Everything is alright!” they would yell back. Beyond providing a light source, the fogatas became a tradition. “Neighbors who previously did not speak to each other got together at their fogata to defend and to talk on a daily basis,” Alan Silva Guardan, a 26-year-old artist and activist, told MintPress. Luz Torres fought back tears as she recalled those early nights and how, in what seemed like a miracle, her fogata was left one evening with only a certain type of wood that is known not to burn; but somehow it burned those nights, providing light and hope to those on the streets. Everything was discussed around the bonfire, from daily banalities to long-term strategic plans. One resident said he saw it as a richer type of democracy, where everyone has a voice. The fogatasbecame the basis of a new form of grassroots political participation. The loggers did not go quietly, and Cheran was in a virtual state of siege for months in 2011. Several residents were murdered by the cartels. Luz said a member of her fogata insisted on checking on his land on the outskirts of town. His body was found days later; it has been burned and mutilated. But over time, the residents gained the upper hand. After dispatching with the loggers and cartels that hired them, the discussions at the fogatas shifted to the corrupt politicians who enabled their tormentors. Local elections that were planned for November 2011 were canceled after the community petitioned electoral authorities to enact a Mexican law that allows Indigenous communities to practice self-rule. After a protracted legal battle, the Superior Court of Mexico’s Electoral Tribunal of the Federal Judiciary formally recognized Cheran’s political autonomy. Cheran is today governed by a system called “uses and customs” that replaced the system of political parties. There is a 12-member Head Council whose representatives are chosen by assemblies held in the town’s four neighborhoods, the delegates for which are selected by residents at their fogatas. The funds and resources that used to go to municipal authorities now go to the council. “When we say ‘uses and customs,’ it is just another way of saying we are going back to the teachings of our ancestors,” Guerrero told MintPress News. While some still occasionally use the word “government,” most here reject that term, as the elected officials are seen more as public servants, fulfilling a duty, rather than ruling over the people. This system allows for a closer auditing of public funds, and residents say they believe public money is now better spent. In neighboring communities, there are posters and signs for the upcoming election in Mexico, but not in Cheran. Some residents here are considering voting for Andres Manuel Lopez Obrador, the leftist former mayor of Mexico City who has promised to tackle corruption and address insecurity in the country. To do so, they will have to travel to a neighboring community, as the electoral authority will not be allowed to set up a voting center in Cheran. Other communities have followed their lead, there are at least eight other communities in Michoacán that have said they will not allow voting centers. “This project that we are living, it is a project that in some form, without political parties, is giving us results,” said Guerrero. Gone too are the local police; the forest is now protected by “forest keepers,” who are chosen from the community to patrol the surrounding areas. Residents also say they feel much safer now that the police are gone. Petty crime is handled by the community. 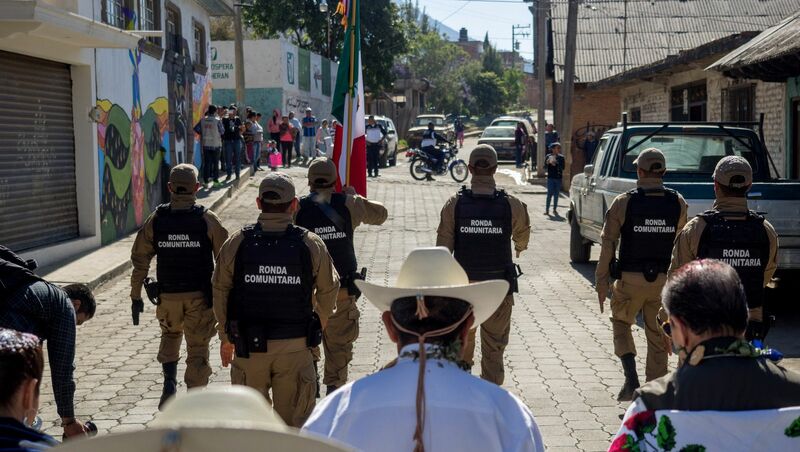 The state where the so-called war on the cartels began a decade ago, Michoacán is one of the most dangerous states in the country, but not in Cheran. Even late at night, the streets of Cheran are filled with children playing. But Cheran is not out of the woods yet. Residents are worried that complacency could set in and political parties could work their way back into the community. They are keenly aware that there are forces that would like to do away with the example Cheran has set. “We have to keep remembering in order to strengthen our culture, our community,” said the young activist Guardan. As part of the commemoration of the uprising, the community organized a massive march that wound its way throughout Cheran’s four neighborhoods. In every neighborhood, there is at least one mural dedicated to the people’s struggle. As they moved through the town, residents came out of their homes and cheered them on, some throwing confetti as people passed. Children — some of them not yet even born when the uprising took place – put on skits with their classmates, defending their fogata or acting out the arrest one of the illegal loggers. Many wore bandanas on their face and carried wooden replicas of guns. 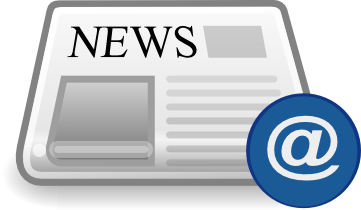 The events of April 15, 2011 are deeply ingrained in the town’s culture. “It is a means of keeping the oral tradition, the knowledge of previous generations, alive,” said Guardan.